From the beginning of our time in the village, a group of about 30-40 women showed an interest in meeting once a week for Bible study. This group became the core of our work there. In addition to Bible studies we worked with them on projects that could save them time and resources as they took care of their families. 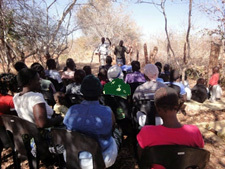 The Bible studies were met with interest and enthusiasm partly because they were given the opportunity to participate in discussion and to offer their experience and knowledge as an asset to the group. One big hindrance to Bible study was that only four or five owned Bibles. Thanks to some of our wonderful donors we were able to give each one a Bible in their own language. They have continued to read and study and continue to meet for Bible study even when the missionaries are away. After several months, a few men approached Daniel and said that they wanted to learn what their wives were learning. As more interest developed, a church was born in the village. 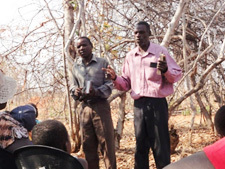 In August of 2014, the first church service was held in the Jengwe district. This is a more remote area of the village and most people there have never been part of a church. Every Sunday before the worship service, Daniel would lead a Bible study focusing on the basic beliefs of Christianity. Again, people were given Bibles and asked to study certain verses each week in preparation for the next lesson. The people’s faith has grown. Several came to realize they needed to be baptized. The challenge was finding a way to baptize them. There is a drought. Rivers are dry. It is too far to town to be able to transport a group to a public pool. The answer was to dig a baptistery. A hole was dug in the ground, lined with tarp and shower curtains. On Easter Sunday the people were asked to bring water with them to the service. The hole was filled and 24 people accepted Christ as their Lord and Savior and were baptized that day. Today, the church continues to grow. A children’s Bible study hour has been added to the Sunday schedule. New people have started to attend and are attending a new series on the basic beliefs of Christianity. Please pray for all these new believers.